Preheat the oven to 220°C/fan200°C/gas 7. Mix the aubergines, onions, peppers, garlic, 3 tablespoons of the oil, and a little seasoning in a bowl. Transfer to a large roasting tin and cook for 30 minutes, or until soft. Meanwhile, heat the rest of the oil in a large frying pan. Fry the courgettes over a high heat for 4 minutes, until browned. Tip onto a plate lined with kitchen paper and set aside. Remove the roasted veg from the oven. Stir in the courgettes. Lower the oven to 200°C/fan 180°C/gas 6. Make the sauce. Bring the milk to the boil in a pan, then set aside. Melt the margarine in a pan, add the flour and cook for 1 minute. Remove from the heat. Gradually stir in the milk. Bring to the boil, stirring, then simmer gently for 10 minutes, stirring occasionally. Cook the lasagne according to the packet instructions, separating the sheets and draining on a clean tea towel. Add the cheese to the sauce and season. Spoon a thin layer over the base of a buttered 2.4-litre shallow ovenproof dish. Cover with 4 lasagne sheets, overlapping them slightly. 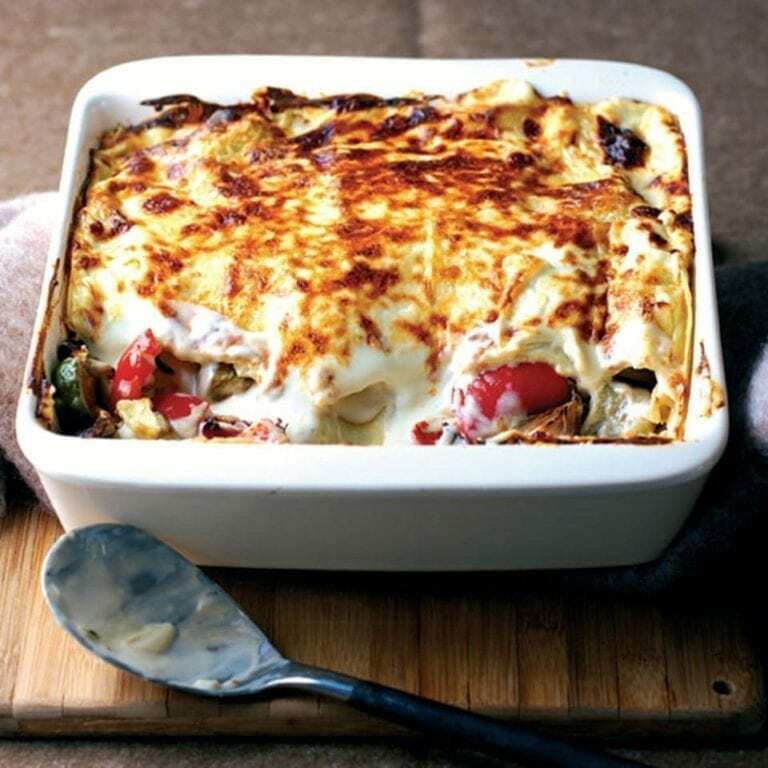 Top with half the vegetables, then one-third of the remaining sauce and another 4 sheets of lasagne. Repeat once more. Spread over the remaining sauce and sprinkle with Parmesan. Bake for 40 minutes, until golden and bubbling. Serve with salad.